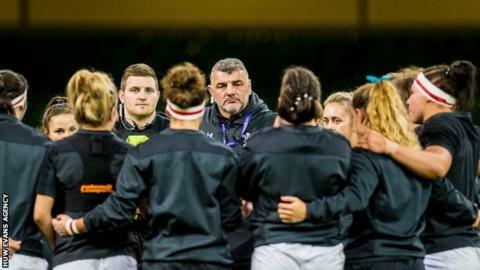 Wales head coach Rowland Phillips says a revamp of women's regional rugby is already delivering results. The championship between Ospreys, Cardiff Blues, Scarlets, RGC 1404 and Dragons has changed to a compact run of games, rather than throughout the season. It launched with the Super 5 tournament at St Helen's in Swansea on Sunday. Players have been put through an intense pre-season and Phillips says there are visible improvements. He told BBC Sport Wales: "A lot of people have impressed me... there's a lot of confidence in the group. "We set this programme up for the girls to work in the regions. "They've had seven weeks prep and what we were hoping was to see better standards, better fitness levels and certainly on the evidence of the games we've watched, the programme itself has delivered." Wales finished bottom of the 2018 Six Nations table and this season's changes have been designed to aid preparations for the 2021 World Cup, which they have already qualified for. Earlier this year Phillips put out an appeal for any player with regional or international ambitions to sign up for his new pre-season skills and conditioning programme. He said he was pleased to see it had attracted new faces. "It meant the senior players that are established needed to work hard and push their game forward, but also then it was an opportunity for young players, new players, to step up," he said. "I've been impressed across the board. "Some players have stepped over from other sports and others have come through the under-18s system so I'm really happy with how Sunday went," added Phillips. The regions are now preparing for five more rounds of competition, starting with a double header at Sardis Road, Pontypridd on Sunday, 16 September. Phillips said the block of fixtures was a chance for him and his coaching team to look at players ahead of the autumn internationals. "We'll not just be looking at individual performances on the day," he said. "It gives us a chance to see some consistency at at higher level - then we'll be in a position to announce the squad."